Everyone loves a company that listens to its customers. These are companies that not just understand their clientele, but also produce items that really suit their needs. In comes the Humminbird Helix 9. 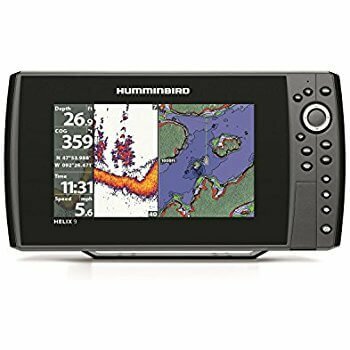 Recently upgraded with suggestions from customers to make it better than ever, Humminbird has produced a fish finder that works for fishermen of all levels. Whether you’re looking for the occasional adventure on the water or you typically find yourself out on the water looking for the next big catch, the Helix 9 gives you a large display and enough features that you’ll instantly fall in love with it. This review will go over all the main features along with discussing the numerous variants so that you get exactly what you’re looking for. Most 9-inch fish finders are rather bulky, unwieldy even. But not the Helix 9. Measuring a very sleek 13.4W, 7.12H, and 4.2D inches, this makes the unit easy to install and carry around, based on your preferences. Not only that, but it’s quite light, ensuring that you have no problems using it. 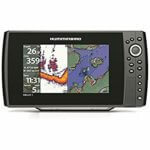 The plug-and-play nature of this fish finder ensures that you can get it standard within a few minutes. The mount can quickly install or release so that it’s simple to use and remove. Another nifty feature is that the Helix 9 offers two different SD card slots so that you can record lots of data, install updates or swap out cards for even more capacity. You gain access to the AutoChart feature that provides real-time images as you go through the water, and you even get up to 8 hours recording time. All of the features are wired to buttons on the side, meaning that you won’t have to dive through tools or menus to find what you’re looking for. You can also split-screen your view to see different images of the water, ensuring you get the best clarity. The Helix 9 is aptly named as it features a 9-inch display (I looked at the 7″ display models here) with a good resolution of 480-by-800 pixels and 1,500 nits of light, keeping it nice and bright during both the day and night. Being glass-bonded, it is resistant to glare while also providing an extra dose of durability. If you need a display that’s both clear and can take a few dings here and there, then look no further. Fish finders and other GPS units aren’t known for housing the strongest CPUs, but they still need a sizable amount of power to ensure that the images don’t lag. This is especially true for a fish finder, where you’re tracking living creatures that might be trying to get away from you. Humminbird has upgraded the processing power of the Helix 9 so that it keeps up with you and all the critters under the depths. This new CPU gives the Helix 9 25% more power, and you’ll really notice the difference when you compare it to other similar fish finders. It can provide real-time imaging through your entire journey, making sure that you don’t miss a school or the big one you’ve been looking for. This is a typical feature amongst all the Helix models that helps you change from broad search and clarifying images. SwitchFire is a proprietary take on TVG or Time Variable Gain. In short, this is a feature that allows you to change the image from either a broad look where images are somewhat blurry (as they are with most sonar images) to clearer images to see if the objects are fish and if they are big enough to be worth catching. You can choose between Max, which is broad and larger at 83kHz and then Clear at 200kHz. Both of these are easy to change and they will help you find the perfect area to cast off. Max is better for deeper waters since the Clear signal isn’t powerful enough to penetrate too deeply, but it’ll help when you’re right over the area you plan on fishing. The CHIRP feature started as a military GPS feature, but it has since been added to specialty GPSs like fish finders. This helps you get the clearest image possible by bouncing waves of various strengths off the targeted area. Instead of getting readings from one type of pulse, this gives you the best readings possible so that you can easily see what’s under the depths. This feature comes standard with all of the Helix 9 models. The entire lineup of Helix 9 models come with GPS capabilities, so you’ll get it no matter what. As you can expect, this allows you to easily see what’s around you and keeps you from getting lost if you’re going in unfamiliar territory. Along with basic GPS functionality, this will also display how quickly you are moving, and you can even program up to 45 different routes. As for waypoints, you can program up to 2,750 of them. Aside from the massive CPU boost, the Helix 9 boasts impressive wattage, depth, and frequency. Starting with overall power, the Helix 9 has a transmit power of 500W and peak-by-peak of 4,000W. The sonar itself can transfer between 83 and 200 kHz for 2D images and 455kHz for down imaging (explained below). Depth clocks in at 600 feet for most 2D images, and 35 feet for side imaging (explained below). This should give you a very clear view of what’s swimming around you and if it’s time to stop or keep moving to the next waypoint. Side-Imaging and down-imaging have become very popular with fishermen as this gives you a much better view of what’s under the surface. Side-imaging creates a 180-degree plane that allows you to see what’s to the left and right of the boat, not just right underneath it. In contrast is down-imaging, which is likened to a fish’s POV. This gives you ultra-clear images that help you see exactly what’s down there. Whether it’s a fish or something floating along with the water, you’ll see exactly what’s down there. The difference between regular and mega models is that mega ones have even more clarity and somewhat boosted power, giving you more depth and a better view of the water. The Helix 9 lineup is a powerful array of fish finders that will help you find everything swimming around you. The base model gives you a laundry list of features that you’re sure to love, but be sure to check out the others as well if you’d like side-imaging, down-imaging or boosted power for even more clarity. Even the choosiest fisherman should be happy with any of the Helix 9 models because they give you everything that you need and more at a very fair price point.